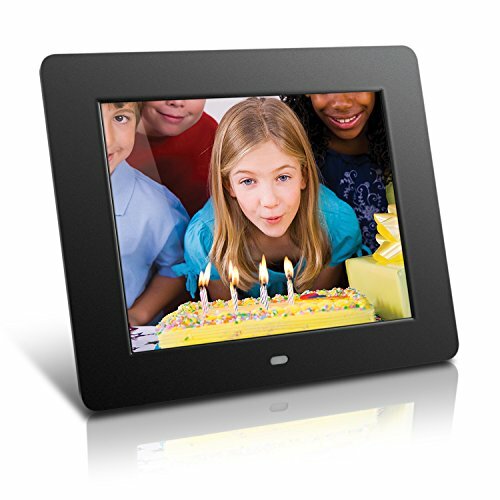 Aluratek's 8" digital photo frame will allow you to set-up photo slideshows set to background music. Slideshows can be configured to play photos in various display and transition modes. Photos will be automatically resized to fit the LCD screen in a 4:3 aspect ratio. ADMPF108F supports various media formats. In addition to photos, ADMPF108F also plays videos and music through the frame's integrated stereo speakers. Simply connect a storage device such as a USB flash drive or insert an SD card into the photo frame to access your media content. Transfer and store files quickly and easily from your personal computer to the frame's 4GB built-in memory with USB 2.0. For an even more complete media experience, Aluratek digital photo frames include built-in clock and calendar and auto on / off timer so you don't have to unplug your frame before going to sleep, leaving the office or worry about wasting energy. From the frame's settings you can schedule the times when your frame will automatically turn on and off - perfect for the home or office. A compact remote is included for ease of operation and control.